In the ever-growing narrative of Korean idols dating, Wonder Girls’ Sunye has contributed to the ongoing trend of idols being frank about their relationships. This trend gained momentum when SHINee’s Jonghyun and actress Shin Se Kyung were essentially caught dating and had no choice to admit it. Beast’s Jonghyun and Kara’s Goo Hara and a sea of other couples followed suit. And now, Sunye joins their ranks. 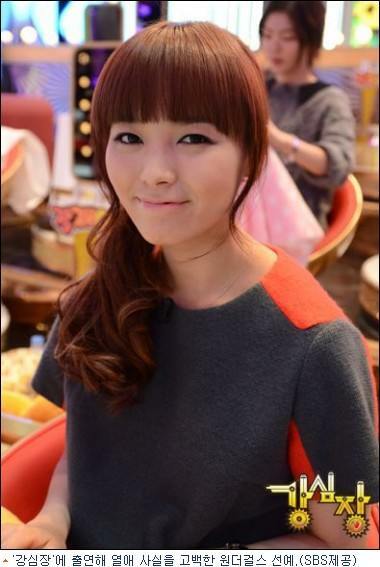 What is interesting about this situation however, is that Sunye opened up about her relationship of her own volition. And not only did she admit to it of her own volition, but she also admitted to dating a non-idol. Congratulations to the girl! A beautiful voice, a beautiful face, a beautiful heart, and now, a beautiful relationship. Sunye is a fan favorite across a variety of boards. She is loved by idols, by Wonderfuls, and as proven by our Miss Seoulbeats pageant, by Seoulbeaters as well. And this is not with reason. This girl seems to have a lot going for her but of all these things, it seems like her warm, honest heart and soul is the cherry on this cake. A relationship with her would most likely be composed of a lot of love, affection, and effort. We may not be on each other’s speed dial, but she seems like to be a very sweet, caring person with a lot of love to share in any relationship, regardless of the nature. Her relationship with this man is most likely no exception. On top of that, not only is it a big step for an idol to admit to a relationship, but it also says a lot about Sunye as a person. She admitted to the relationship because she felt that it was her responsibility. It may not be any of our business but she was honest with the public and honest to her relationship by admitting to it. This isn’t something to pat her on the back for as an idol, but as a person. Being famous definitely places irregular pressures on idols but it’s nice to know that some idols don’t let these pressures get them and stand by their own principles.